Dietary fiber is essential for healthy living. Found mainly in fruits, vegetables, whole grains and legumes, dietary fiber offers a variety of health benefits. They include relief from constipation; lowering the risk of diabetes, heart disease and some types of cancer; lowering cholesterol levels; and helping to maintain a healthy weight. Most healthy eating plans such as the U.S. Department of Agriculture‘s Food Pyramid and Harvard University’s Healthy Eating Plate, which complement each other and summarize the best dietary information available today, stress the importance of a diet high in dietary fiber. A good source of dietary fiber is brown rice. According to USDA studies, 1 cup of brown rice, a whole grain, has 4 grams of fiber as compared with white rice, which contains only 1 gram per cup. In a half-cup serving, brown rice also contains 1.7 grams of resistant starch, which boosts metabolism and burns fat. Brown rice is also a low-energy-density food, meaning it’s heavy and filling but low in calories, and it has more nutrients (magnesium, phosphorus, manganese, selenium, copper and potassium) than white rice, which has been milled to remove everything but the white endosperm portion of the grain. 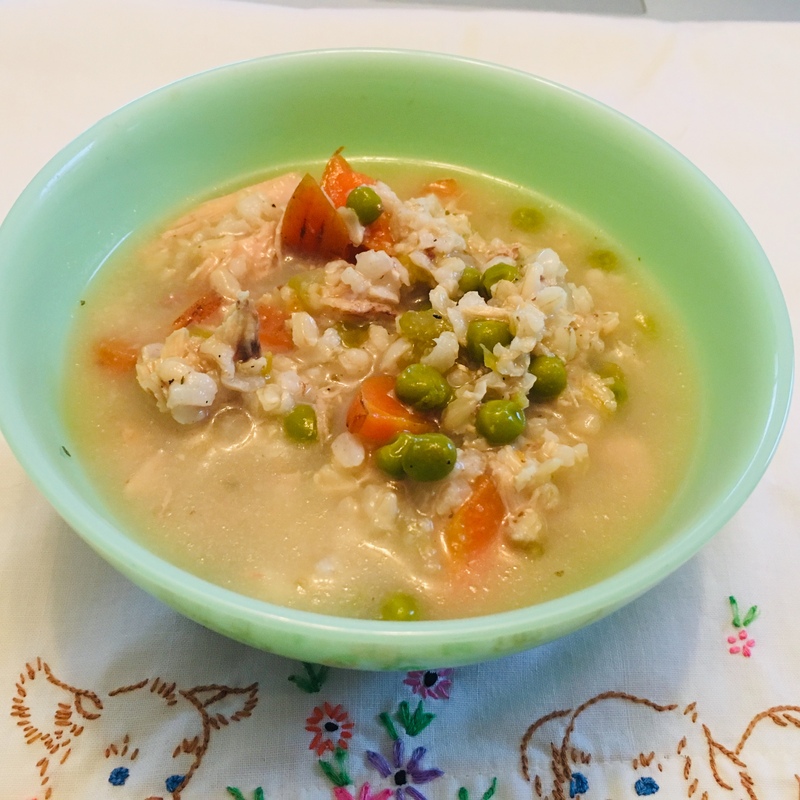 Given those statistics, that’s why when making a rice-based soup such as the following, I use brown rice. Combed with the vegetables and chicken in this soup, it’s a meal-in-a-bowl, one any health-conscious diner would have to salute. Place all ingredients in stock pot. Bring to a boil. Reduce heat and simmer for about 2 hours. Is that 1 cup cooked or uncooked brown rice?